Inevitable as it is, nobody wants to hear the word autumn and the chilly, wet weather that immediately comes to mind. But with the late summer bank holiday having already been and gone the end of summer is sadly within sight. Autumn in the UK is a time of year when we can expect particularly unsettled weather, with persistent, heavy rain and strong winds becoming a more and more common occurrence – and an ever increasing risk to your car. Typically one of the biggest private investments after your house, your car is something you will want to protect from the elements, not just for the sake of the car itself, but also the expense and inconvenience of weather related insurance claims. It only takes debris to be whipped up in the wind or a small branch to fall to wreak havoc on your motor. With this in mind, now is a great time to review how well your garage protects your car – or indeed anything else you may store inside your garage – and consider replacing the door if it is beginning to show signs of age or excessive wear. There are several tell tale signs that your garage door may be overdue for replacement. Here is a guide to what to look for. Start with a visual inspection from the outside, with the door closed. To help, it is a good idea to clean the door in accordance with the manufacturer’s instructions first. If there is obvious rust or peeling/flaking of paint, this indicates that the protective outer layer of the door may be compromised, potentially leading to swift deterioration over the autumn/winter months. In some cases, it may be possible to address this problem with early intervention – it is recommended to seek the advice of a professional supplier/installer. Next look for any bent or buckled sections, or panels that are showing signs of lifting. These may not be a problem now, but heavy winds can soon turn them into a problem, and they may allow rain to penetrate. Weather aside, any structural damage also presents a security risk. If the door itself shows any sign of buckling, its strength could be compromised and this may also be a risk to your safety. Inside, look over the mechanism and frame. Any excessive rust or wear could indicate that attention is required, whilst any obviously broken parts should be addressed as soon as possible. Make sure that the door appears to be sitting flush and straight, with no obvious gaps around the edges. Make sure that any frames are also flush to the walls and not showing signs of bending, twisting or breaking away. First, unlock the door. Make sure that the lock feels smooth and the mechanism/handle is firmly fixed. If the handle has become loose, this ought to be addressed before it is able to leave you in trouble. If you find resistance when turning the key, this should be dealt with sooner rather than later as there is a risk of the key snapping inside. If the locking mechanism is not working properly, there is a risk that strong winds might cause real damage. Next, open the door as you normally would. It should open in a smooth, continuous motion without jumping, jarring or snagging along the way, and shouldn’t need any excessive force to be applied. You shouldn’t hear any noises that indicate resistance either. Check that the door remains level throughout opening and when it is in the fully open position, and make sure that is feels firm when open. Check the frames again to make sure that they still appear flush to the walls. Doors that have an automated system should be professionally serviced at the correct interval in accordance with the manufacturer’s instructions. This typically forms a condition of the warranty. If you decide that your garage door needs replacement, then it makes sense to consider the options and invest in the ideal door. Consider the style of your home, as well as how you intend to use the garage. There is now a great choice of doors to suit a range of needs. For many homes, a traditional up and over garage door will be the ideal choice, especially if replacing like for like. One piece up and over garage doors are an old favourite and extremely practical. Canopy garage doors are the most common type of garage door found in the UK and feature a spring mechanism at the top of the door to provide the counterbalance lift. A retractable garage door, in comparison, has horizontal tracks mounted on the ceiling or sidewalls to guide the door back into the garage. The door panel retracts fully into the garage. Up & over garage doors can be made from steel, timber, white glass fibre, wood effect, fibreglass or ABS and are available in numerous styles and finishes to suit every style of home. If you are looking for greater security and even better protection from the weather, it is worth considering a sectional garage door. Although they tend to cost more than their up and over counterparts, all-round rubber seals and gaskets between the sections prevent draughts and debris blowing into the garage. Models such as the the Hormann 42mm insulated electric sectional garage doors also offer Secured by Design accreditation, which will give you maximum peace of mind and may help to reduce insurance premiums. 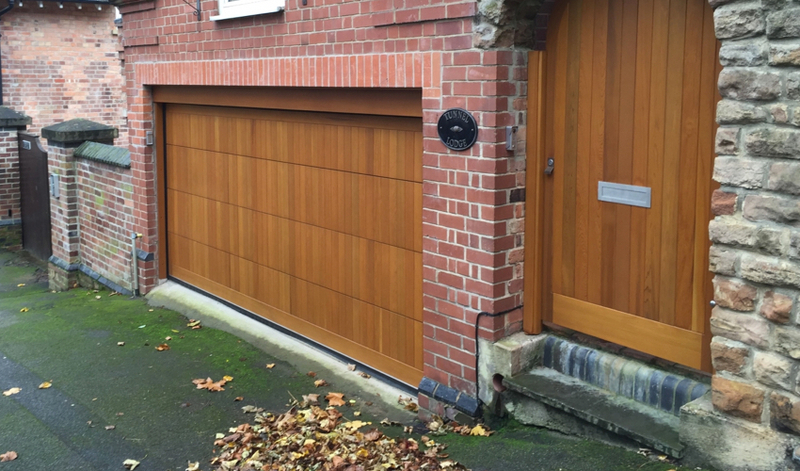 As well as traditional options, we can supply sectional garage doors for more exclusive properties, such as the Hormann cedar door timber sectional fully finished in light oak for a period home or the extra wide Carteck door in solid smooth anthracite grey for an extra modern look. Customers with more specific needs may find that a roller garage door is the ideal choice. Our range includes remote control insulated roller doors and continuous curtain type roller doors, which can be manual or electric. Generally fitted onto the rear of the brickwork aperture, they maximise garage entrance width and height, and do not require any unsightly or intrusive tracks or springs. This in turn means less clutter in the garage and a much neater, professional finish that allows you to use your garage space more efficiently. They are available in a wide variety of finishes including Golden Oak and Rosewood for those looking for a timber effect. There are also enhanced security features available in some models, making them ideal for garages used as tool lockups, workshops and similar. If you want to beat the weather and get a new garage door ordered and fitted by experts at the best possible price, give the team at Arridge Garage a call today on 01691 670394.